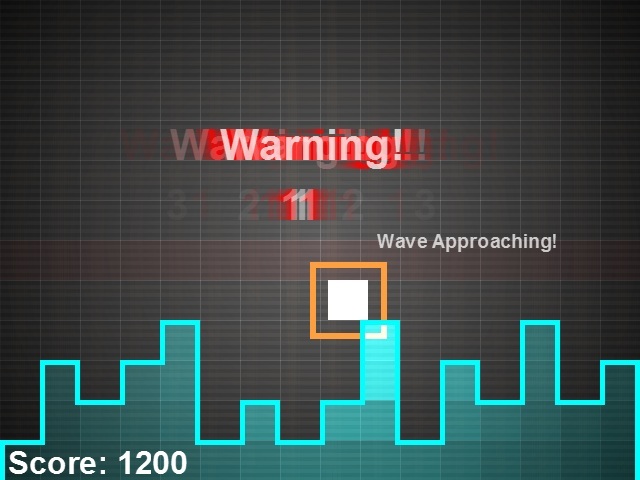 Boxes will appeal to you if you like simple, well-designed and addictive arcade games. It probably won't appeal to you if you're inclined to look for any kind of emotional attachment, motivation or plot in your games. Luckily for Twenty3 Games, I fall into the former category. Boxes is a great game. It's one of those "climb as high as possible" games, but the terrain on which you climb falls out of the sky, so you need to dodge before you ascend. If that sounds boring, some of the blocks are powerups. They also come in waves sometimes. Oh, and there's lava chasing you. And you're being timed. The game is a jambalaya of several arcade ingredients, and what it lacks in emotional motivation it certainly makes up for in traditional arcade pressure. In general, the game is very well put together, certainly falling above the usual standard of polish in Game Maker games. Other than the lava, everything you care about in the game is a box, and the graphical style and execution is commendable considering how little there is to work with in that regard. Like many good games that lack real drawings, this one will impress you with programmed effects. Boxes also features suitable sound and music, including a hidden disco favorite. The best part, though, are the "achievements" scattered throughout the game. This game works you vigorously, but, like some kind of sadistic personal trainer, it rewards you heavily for just about everything, from near-death experiences to embarrassing mistakes. Sometimes, even when you lose, an achievement will appear, sort of as a fortune cookie after the meal you couldn't finish. Even if you had mixed feelings about the game initially, these will probably hook you back in for a couple more plays, just to see what they are and what kind of swag they can earn you. I played this game for just under an hour before I tore myself away to write the review. Only near the end of that hour did I earn the "survived three minutes" achievement. I think that means you should try it. The objective: stay alive. Dodge falling boxes, waves of boxes, lava, and collect power-ups while climbing as high as you can. Includes an online highscore table and 30 unlockable achievements! Nobody has added Boxes as a favorite game yet. Be the first. FallenMaster made a game with the same gameplay style a while back but this game's better.